vital to the Industrial Revolution. Timber pile viaducts were once a common sight in Wales — a rich heritage of the Railway Age (c.1830-70). They were designed by eminent engineers of the 19th century as part of the rapidly expanding railway networks that served the South Wales industrial complexes and the coastal areas of the whole country. In this adaptation of Stephen K. Jones' essay, the reasons for using timber in Welsh railway construction are explored, principally through the work of Isambard Kingdom Brunel (1806-59) on the South Wales mainline and lines serving the Welsh valleys, and through the work of various engineers working on the Cambrian Coast Railway. Sadly, almost all the major viaducts have gone — only one of those discussed survives and few remnants of others remain. 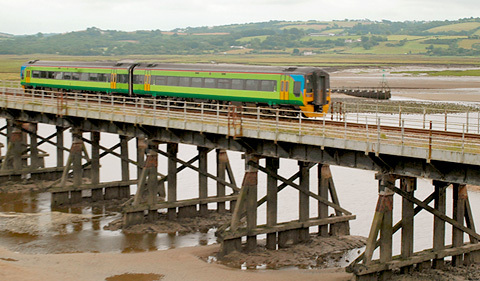 Brunel's Loughor Viaduct, pictured above, was replaced as recently as 2013. Barmouth Viaduct, possibly the best known example in Wales, is however still in use, and is one of the longest extant timber viaducts in the UK. "... I have used timber a great deal in construction and see no difficulty in making arches for railways of 250 feet span — in fact I am projecting a larger one at the present."